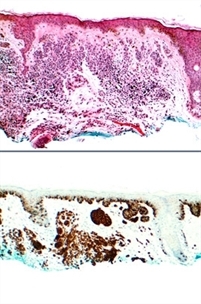 SaraPath Diagnostics® offers comprehensive diagnostic pathology and laboratory specialty services for the evaluation of neoplastic and inflammatory diseases of the skin. All cases are interpreted by our board-certified, fellowship-trained dermatopathologists, who are readily available to discuss specific cases. SaraPath’s superior laboratory testing services include comprehensive immunohistochemistry, direct and indirect immunofluorescence, mycology analysis by PAS stains, B and T-cell gene study, technical slide preparation, frozen sections and rapid permanent sections in emergency cases. Backed by over 90 experienced technical and support staff, SaraPath’s pathologists provide clients with timely and accurate diagnoses and customized, integrated pathology solutions. SaraPath has been serving the Southwest Florida medical community for more than 35 years. We take pride in our longevity and in the relationships we’ve created with our referring clinicians and hospitals. Pathology results are available within 24 hours on routine specimens. Multiple connectivity and ordering/reporting options are also available to increase efficiency and turn-around time. Please contact our Client Services Center for more information.